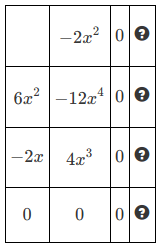 I've added a new polynomial division page that generates random questions and asks you to fill in the answer, one step at a time. The page is here, along with its partners - a polynomial division calculator and example generator. An initial grid is set up, with the divisor written down in the first column on the left. Everything else is unknown. 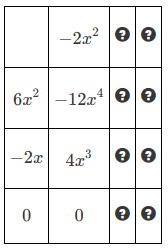 This is a grid for polynomial multiplication, but we only have one polynomial - we don't know what to put along the top for the other multiplicand. 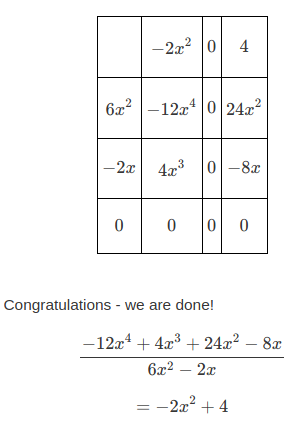 If we think of the division question as N/D = Q (numerator divided by denominator gives the quotient), the corresponding multiplication problem is DxQ = N, we have D (the denominator or divisor) and we want to find the Q to put along the top so that the contents of the grid give us N (the numerator or dividend). In terms of the grid, you are being asked for the coefficient for the term that will go in the leftmost empty cell in the top row. 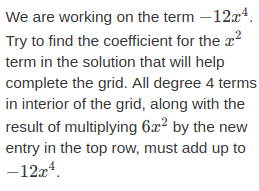 It turns out that no degree 1 term is needed in the solution since we already have all we need in the grid. When doing these by hand, you can just move on to the constant term, but on this page you actually need to put a 0 in the degree 1 column. Since there are no degree 2 terms in the table, the coefficient required is 4. ... and it turns out that the linear term also works out, as there is no remainder in this case. Try out the polynomial division practice page here, and visit this page for links to other posts and resources on the topic.